Like many others, I work at a site that prohibits camera cell phones. In my case, that includes phones left in your car. Every year, it gets harder and harder to find an acceptable cell phone with decent sound and basic hands-free features. Many carriers no longer even offer a non-camera option. Some companies like Blackberry offer special versions of their phones without cameras but these models can only be purchased with expensive long-term commitments. Lately, I've begun to consider the option of owning two cell phones. Prepaid of course! One dumb phone for work and a decent smart phone when I'm not on campus. For the smart phone, I'm leaning toward a Virgin Mobile Android phone. It's time to travel 20 years into the future to 2011. As for the simple non-camera phone, it was anything but simple to locate a decent non-camera phone with a low monthly price. Even with the help of Phone Finder, it was a chore. I ruled out most carriers because cost per month was my major factor NOT price per minute. I would have very much like to try PlatinumTel which would have given me 2000 minutes for $100 that wouldn't expire for a year. That averages 166 minutes/month for $8.33 which would more than meet my need to make an occasional call from work. Sadly, every phone had a camera. I ended up going with a similar plan from Tmobile but at 10 cents/minute instead of 5. 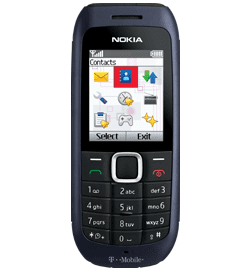 The kicker was the only non-camera phone Tmobile sells is the worst cell phone I ever heard of ... the Nokia 1616. This phone doesn't have an ear speaker. No really, I'm not joking! The phone includes a speakerphone speaker on the back of the handset and a hole in the plastic to route the sound to your ear. The reviews are horrid with most people reporting bad sound quality and low volume. Gee, I wonder why. Thankfully, Tmobile sells SIM card kits so I bought a SIM and an unlocked phone from Newegg. They had an unlocked Samsung SGH-A107 for $25. It's only the most basic phone but placing voice calls is all I need. I considered the same phone cheaper from AT&T but unlocked has a great deal of appeal. Real life can be crazy! I won't hold my breath that common sense will prevail. Hasn't happened so far ... why start now.